A bed bug can be described as a flat reddish brown insect with an oval shape. This insect can be found everywhere on the globe i.e. public places, offices, stores and homes. It is approximately the size of an apple seed. A bed bug primarily feeds on the blood of birds and animals, preferably people. Before it feeds, a bedbug is flat and brown but turns reddish-brown in color and become larger after feeding. 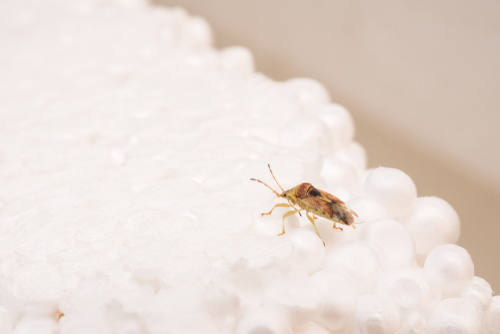 Baby bedbugs are whiter, smaller and much harder to spot compared to adult bedbugs. Female bedbugs are capable of laying 200-500 eggs in her entire lifespan (6-9 months), the eggs are the small as a grain of rice and take about 10 days to hatch. They tend to hide during the day but come out during the night to feed. The most fascinating fact about adult bedbugs is that they can survive a whole year without feeding. They are attracted by the air people exhale and body heat and can travel from one place to another on personal belongings and clothing. They primarily move by walking and cannot jump or fly. • Dead bed bugs in your bedroom or on your bed. • Dried remains of bed bug skin that has been shed on your bedding. • Blood stains on pillow cases, blankets and sheets. • Black dots i.e. bed bug excreta on your mattress, pillow cases, blankets and sheets. • Itchy red bumps on the body. In places with heavy infestations, the treatment and even removal of the infested mattresses and furniture is necessary. However, if bed bug exists in small numbers, it is very possible to physically remove them from harborage sites and mattresses via vacuuming. It is important to keep in mind that that they can be quickly distributed to other places through the equipment used to kill them. Therefore, the vacuum ought to be bagged and utilized only for the killing of bed bugs. The vacuuming should be done regularly until all the bed bugs are killed. However, vacuuming will not eliminate all bed bugs because some will hide in inaccessible sites and can even hold tightly to resist vacuuming. This is why the mattress should be enclosed in any good quality zippered mattress cover to trap and suffocate those that remained. The cover should be left in place for one year as that is the maximum period they can survive without a blood meal. Bed bugs are very heat sensitive. In fact, 118-122°F is the range of their thermal demise. This is why people combine insecticide treatment with steam cleaning in killing bed bugs, its is very effective compared to only using insecticides. It is best to begin steam treatments with mattresses by applying it to the handles, under labels, to seams as well as both outside and inside the bed base or frame. You can also steam treat carpet edges, cushions of sofas and chairs. Currently, there is commercial dry heating services that are designed to eliminate bed bug infestations. The current commercial heating label is 130°F for 3 hours and 140°F for 2 hours. This is guaranteed to kill most bed bugs as well as their eggs. Steam temperature of 113vF needs an exposure time of 7 hours, 118F needs an exposure time of 90 minutes and 122°F needs an exposure time of less than a minute. It should be noted that bed bugs are also very sensitive to low temperatures i.e. extreme cold. This means that if you take small items, put them in bags and freeze them below 0º F (-19º C) for at least four days then bed bugs on the items will be killed. It has been established that insecticides on their own cannot eliminate bed bug infestations. However, there are powerful bed bug pesticides used by only commercial pesticides applicators. In addition, professionals possess the necessary expertise and equipment that is required to effectively apply insecticides to kill bed bugs. These insecticides are available in the form of aerosols, dusts and sprays. Generally, sprays are ideal for killing bed bugs hiding in crevices and cracks, along door and window frames, behind crown molding, in closets, along floor-wall and ceiling-wall junctions and behind baseboards. Bed bug dusts are considered to be superior to sprays because when they walk on the dusted surfaces, they get covered in it and die. Dusts are best suited for killing bed bugs in electrical outlets and wall voids. There is a special kind of dust called desiccant dusts that kill bed bugs through the absorption of a protective layer of wax that is on their outside body. Lastly, aerosol formulations kill bed bugs in wood framing, carpet tack strips, chipped paint, nail holes, drawer slides, under sides of drawers, crevices and cracks. Most aerosols are preferred because they are good at killing bed bug eggs. The list above is not exhaustive but these are the most effective methods. Structural fumigation is a technique that is guaranteed to completely eliminate any bed bug infestation regardless of the complexity of the environment and severity of infestation. It might be costly but is very effective when it comes to killing bed bugs. There are many over-the-counter pesticides for killing bed bugs but these are not recommended as their performance has not been tested. If you are experiencing a bed bug infestation and prefer to use insecticides, it is best that you hire the services of professional pesticide applicators that are licensed ad have the necessary experience in killing bed bugs.